This spin-off film from the 2010 animated comedy Despicable Me is more fun that its forefather in almost every way. 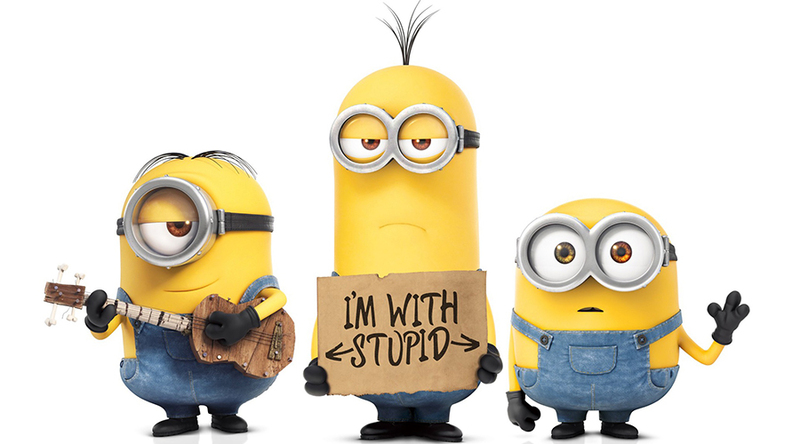 Minions could easily be subtitled The History of The World According To The Minions and in line with that, it has an underlying concept that works extremely well. Its timeline starts from the beginning of time and quickly accelerates to the swinging sixties and as such makes for some very funny history lessons. It also rewards those looking for popular culture references with a wide range of improbable moments. The soundtrack is also fantastically period appropriate and the filmmakers spared no expense in securing the original songs by the original artists. The licensing fees must have been through the roof. The core of the action eventually settles in London and takes full advantage of the Royal family, British culture and the liberal and conservative attitudes of the time. The set design is colourful in the way a lollie shop is colourful and focusing the film on just the trio of minions, Kevin, Stuart, and Bob makes their individual characters stand out. Getting the mix of adult and children friendly humour just right is never easy and in this regard Minions excels. This is a film that the whole family can enjoy together and one that will lead to very few embarrassing questions for the parental units on the drive home.